Peter Eason who is Jack Eason’s son contacted us with the sad news news that Jack passed away at the end of May. Jack was a grand old character of Audax who continued riding well into his eighties. There are no shortage of Jack Eason stories to be told and I am sure we will be recounting them in his memory. I’m writing to inform Willesden CC that Jack Eason passed away on Friday 24 th May. Even though he had been suffering from dementia and confined to a care home in Potters Bar for the last 2 years, he spent every Sunday at his daughters home tinkering with his numerous bikes, happily preparing them for a last ride that was never to be. His time with the club was, for him, the happiest of years and as his son who was in constant admiration of what he achieved with you, I can only offer a huge thank you. Jack was one of lifes real charactors. “I wish i could struggle as fast as him” ! I rode many many miles with Jack. Another top fella gone but not forgotten. What inspirational people this club has. Very sad news indeed. 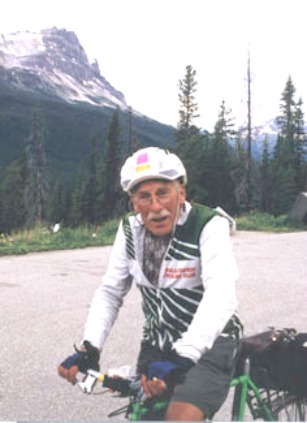 Jack was an inspiration to me in my early Audax days. He (and his pipe!) were much missed when he stopped riding. RIP Jack and my condolences to his family. There are increasingly some great tributes appearing in YACF – I hope his family get to see them as those around us do not always get to hear what truly epic efforts some people make on the bike. Jack was a hero to many of us. He was my hero, so sorry that this day has come. I rode with him on Boston Montreal 2000 and he kept me going. Then we rode together on Perth Albany Perth and other rides after that. The Raleigh bike and the pipe just blew the Americans away. I have lots of happy memories being with him. Jack was a great man, he rode down to Kent for the West Kent Rough Stuff in wellies once because of the rain he thought it would be muddy, rode around faster than some on full MTB’s then rode home. I would like to thank everyone for the lovely tributes written about my father.It has been a great comfort to read them all .I know of many more anecdotes that have yet to appear. My father was always himself and behaved true to form throughout his illness and indeed was the Jack you all knew till the very end. He as the family do,would have loved the idea of a Jack Eason memorial ride,for all the riders new to long distance cycling and strugglin ,the experienced ones trying to become supper randonneurs,and those who already are and do it just for a giggle. Perhaps my brothers and I could join you on the first Jack Eason memorial ride. I never knew Jack, and honestly first heard about him 30 minutes ago. But I have spent those last 30 minutes reading endless anecdotes about Jack on the YACF. I have had tears well up and laughter come out as I read about this amazing man. Those of you who knew him were trully blessed. As a 52-year-old randonneur (I just saw how a lot of you refer to yourselves as “Audaxers”, I love that!) here in San Francisco, California, I will now feel less sorry for myself when I am, as Jack would put it “struggling” up a hill, or feeling tired. He is a man after my own heart, as I have occasionally ridden my bike while smoking a cigar (not on a Brevet though) and have people look at me like I am quite mad. I also find it very inspiring that he started formal distance riding fairly late in life, as I started long distance cycling right after my 50th birthday. More than inspiring, really. I’m sure our more experienced randonneurs know Jack quite well, and many of the repeat PBP riders must have ridden with him. What a guy! I can honestly say, though I have only “known” him since this morning, that I will never forget him and he will trully be missed. Like many I have enjoyed Jack’s company over many miles and through the night. Chugging south of Lincoln to London in the 1997 LEL, or in 1998’s Easter Arrow when he rode solo to meet us after his team parted! There wasn’t anyone like him. A great gent and a life well lived. I have only just read the sad news about Jack in the Arrive magazine. I met him a few times on Audax events – what a great character he was and such an inspiration! I spent many a long mile on my trike alongside Jack. PBP, Great Eastern, 600,400, and more. A very sad passing. On a hilly York 600, a PBP qualifier, and my first 600, in 1999, some of us became anxious, feeling we couldn’t make it within the time limit. Jack told us not to worry, but to continue and finish the course as the experience would do us good. “Remember” said Jack “that it’s only a bike ride!” – then he smiled, and went on ahead. We cheered up – and finished within the time limit! Jack had the right word for the moment – he got things in good perspective.I’ll miss his friendly smile, and wisdom born of experience. Jack was always a pleasure at BMB. Pierce and I were delighted that he came the first time, and tickled when he came back again, and again. It was my honor to know him and love him. He is still missed, even now, over a year later.